Many new homes are now being fitted with keyless entry, the majority of which are installed by the builder to further improve the security and to be used as a selling point. 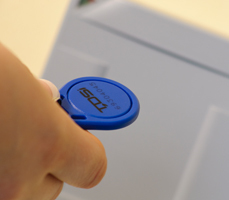 In this day and age keys are being used less and less, at the cutting edge of technology we now have become accustomed to Intercom Systems, smart token systems or even biometric finger print scanners. So why should you home go without these big updates in security and safety? Here at Keyways we have the ability to find you the perfect access solution for your home, new or old. Home access control can start from as little as an intercom system and progress to high-security biometric systems. We listen to your needs and find a system that matches your home and family. 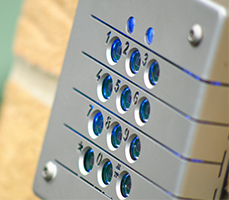 Commonly used for blocks of flats, intercom systems are an easy solution to restricting access to communal areas. Although this may be its primary use, as intercom systems have evolved, so have their uses. Intelligent systems now play a vital part in both high-end commercial and domestic access control, allowing the users to interact and send signals to other integrated security systems without a moments hassle. The majority of these new uses begin life as part of a integrated security system. CCTV cameras and burglar alarms can now easily be signalled by a intercom systems to ensure added security and alert others if need be. The front door can be fitted with a fingerprint reader lock and provides easy and convenient access to family members without needing to remember to carry a key! Keyways Security Systems can provide cost effective fingerprint door locks for your existing home - please feel free to ask for a demonstration at our Hale showroom.